I have way too expensive hobbies. Thank goodness for Christmas and Birthday money. This is so far my accumulated loot for January and it's only mid way through the month. First up is nendo Yui, after delays in pretty much every figure I had preordered for December Yui was the only one released on time. Some of you might remember I bought Demon's Souls which had an empty case with no game disc. I was able to resolve the issue with Best Buy. Since they did not have the game in stock I was giving store credit and used that to get my self a copy of the awesome Bayonetta. I decided to go for the 360 version as that was the one actually developed by Platinum Games. Latter on I dropped by Gamestop and picked up a copy of Demon's Souls. Man is this game brutal, still awesome. Go pick up both games if you own a PS3 or Xbox 360 worth every penny. Last week Amazon had Fire Emblem and Dragon Quest on sale being Nintendo and Squenix releases which tend no to drop in price I jumped at the opportunity to buy them both. Finally in order to qualify for free shipping I added the 7th volume of Yotsuba&!. I'm so content Yen Press picked up the license and has published the new volumes. If you like slice of life manga go pick it up, in fact if you like manga period pick it up. January is way too packed. I still got the Nanoha movie figmas and hopefully Alter's Exceed Mode Nanoha as well. Not to mention Reimu figma which will probably cost me a bit. I also bought Canaan figma and GSC's Instructor Unifrom Nanoha. At the end of the month there are also No More Heroes 2 and Tatsunoko vs Capcom. At least I should have a break in February to save up for the March figure and game releases. 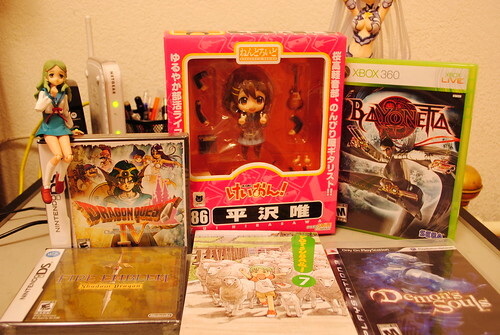 Bayonetta, Demon's Souls, Dragon Quest, Fire Emblem, Hirasawa Yui, Nendoroid, Yotsuba&!